relational algebra – Java, SQL and jOOQ. 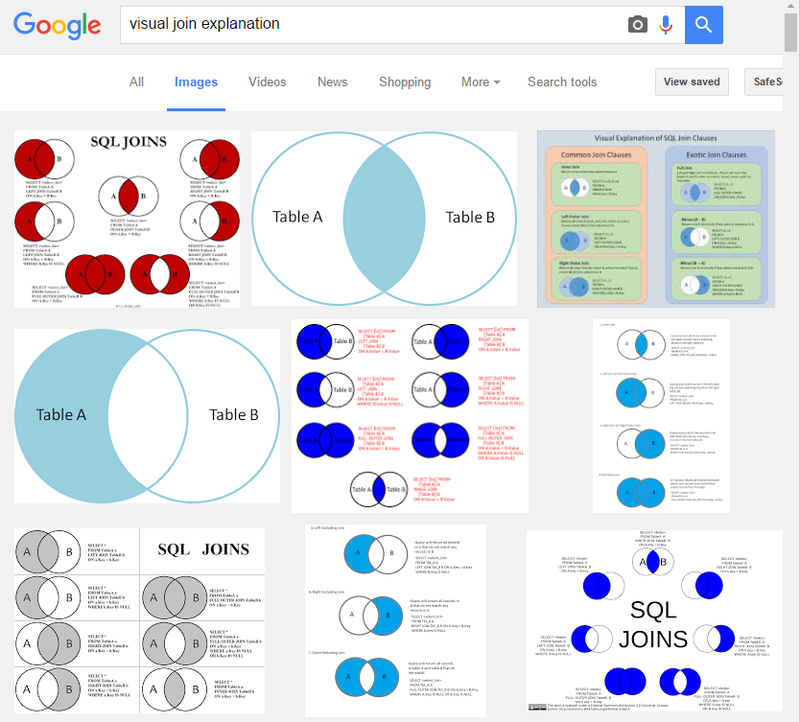 In recent times, there have been a couple of tremendously popular blog posts explaining JOINs using Venn Diagrams. After all, relational algebra and SQL are set oriented theories and languages, so it only makes sense to illustrate set operations like JOINs using Venn Diagrams. Right? Most of you use UNION occasionally. INTERSECT and EXCEPT are more exotic, but do come in handy every now and then. The point here is: these set operations operate on sets of elements (tuples), which are all of the same type. As in the examples above, all elements are people with first and last names. This is also why INTERSECT and EXCEPT are more exotic, because they’re usually not very useful. JOIN is much more useful. For instance, you want to combine the set of actors with their corresponding set of films. So, what’s a better way to illustrate JOIN operations? Remember, in a cross join (in SQL also written with a comma separated table list, historically) is just taking every item on the left side, and combines it with every item on the right side. When you CROSS JOIN a table of 3 rows with a table of 4 rows, you will get 3×4=12 result rows. See, I’m using an “x” character to write the multiplication. I.e. a “cross”. All other joins are still based on cross joins, but with additional filters, and perhaps unions. Here’s an explanation of each individual JOIN type. OUTER JOIN types help where we want to retain those rows from either the LEFT side or the RIGHT or both (FULL) sides, for which there was no matching row where the predicate yielded true. But no one wants to write that much SQL, so OUTER JOIN was implemented. JOINs are relatively easy to understand intuitively. And they’re relatively easy to explain using Venn Diagrams. But whenever you do that, remember, that you’re making a wrong analogy. A JOIN is not strictly a set operation that can be described with Venn Diagrams. A JOIN is always a cross product with a predicate, and possibly a UNION to add additional rows to the OUTER JOIN result. So, if in doubt, please use JOIN diagrams rather than Venn Diagrams. They’re more accurate and visually more useful.